Josh was born and raised in Tucson, Arizona. He was a competitive athlete in high school participating in football, wrestling, and track. In the football weight room is where he discovered his passion for weightlifting. Post high school graduation he began coaching as an assistant football coach specializing in the weightlifting program. This is where he discovered his love for teaching and encouraging others. In the years to come Josh hit a plateau in his weightlifting and was losing his passion for the sport. 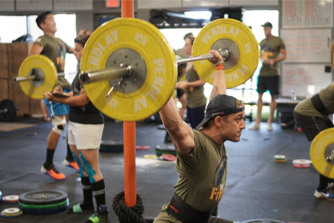 This opportune time was the beginning of his exciting and challenging relationship with CrossFit. Immediately he enjoyed the gymnastic and Olympic lifting aspects of CrossFit and only recently has learned to love the cardio aspect. He believes CrossFit is not only an effective and fun way to train but also an avenue for friendships that will last a lifetime. Josh’s decision to pursue coaching is a reflection of his enthusiasm for the sport, and for helping others achieve their goals.